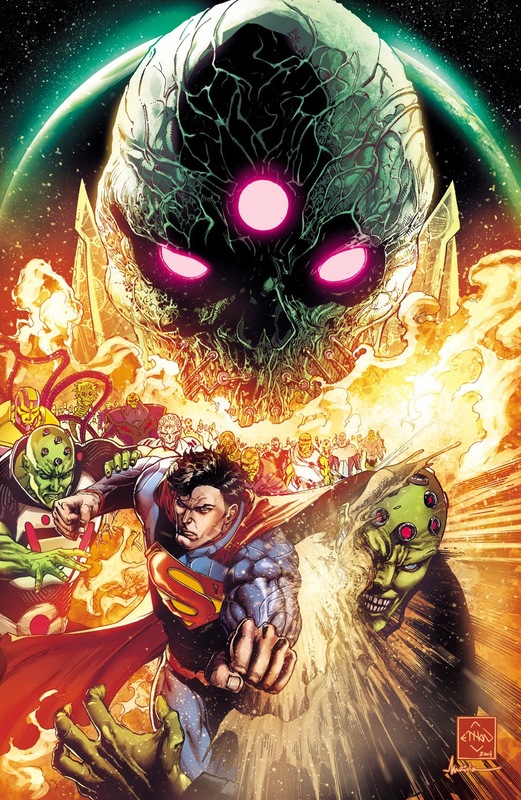 The Earthquakes felt round the Multiverse, Superman’s lost days after Doomed, the World’s End – all these points will converge as the history of the DCU is spun from a new perspective, the perspective of a mad god and his arrogant child. The biggest story in DC history ties into literally every DC story ever told – and it all begins here. The final chapter of Grant Morrison’s ultimate super-hero epic. 'Nuff said. SWAMP THING #40 Final Issue. (W) Charles Soule (A) Jesus Saiz 40pg Other series ending in March include: Batwoman, Infinity Man and the Forever People, Secret Origins, Star Spangled War Stories Featuring G.I. Zombie, Green Lantern: New Guardians, Green Lantern Corps, Red Lanterns, Trinity of Sin, Worlds' Finest, Arkham Manor, Aquaman and the Others, Klarion and Injustice: Gods Among Us Year Three. Whow. That's a very surprising number of titles being cancelled. GLC, GL: NG, and Red Lanterns? And so soon after that big event battle with the New Gods. I haven't been reading the GL titles in awhile, but I'd always hoped they allow Hal to go back to Earth to fight the rogues gallery he had there, but I guess not now. And I guess not too many people stayed w/ Aquaman's team. Wow. Thanks Dale, yeah I think all publishers need to do a decent prune at least annually. While trimming the G.L. line back to just Green Lantern and Sinestro was a surprise (I thought the second title would always be Green Lantern Corps) that franchise has needed a prune since before the DC52 started. While Batwoman was never going to survive after the creative team fallout it suffered so publicly, I still think Swamp Thing is a massive icon in the DC ranks that the public recognise, so hopefully the Green won't be gone for long. Aquaman and The Others is a sad departure too. Dan is one of my favourite creators, but I guess he needs to prepare for writing Convergence above, and as much as I hate to say it, maybe Aquaman is just a one title dude at the moment.